Known as Israel’s cultural capital, Tel Aviv has an architectural identity that is a tale of two cities. The sun-drenched secular metropolis is loved internationally for its bohemian Bauhaus treasures, with some 4,000 historic buildings scattered across the broad, verdant boulevards of its White City district. Then there’s its less recognised postmodern legacy: perhaps best summarised by the 34,500 sq m spacescape of the Azrieli Centre – its epic trifecta of towers completed by Eli Attia & Yaski Sivan Architects just shy of the millennium, reflecting all the futuristic optimism of the late 90s through its design. This split personality is soothed by Jaffa, the historical port just south of the city that has now become the go-to destination for Tel Avivian nightlife entertainment. Countless clubs and 24-hour art venues like the new Magasin III are setting a new standard for the city’s late night culture junkies. Meanwhile, Israel’s startup scene continues to flourish in the ‘Silicon Wadi’ tech cluster surrounding Tel Aviv. 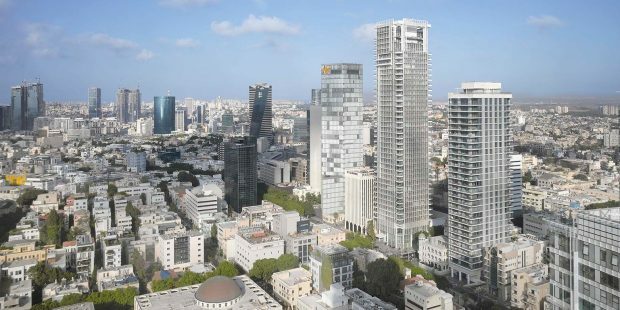 Venture capital-friendly tax breaks introduced during the 90s through Israel’s Yozma business incubator programme combine with the warm weather and high living standards to encourage a more or less steady stream of tech outposts in Tel Aviv. 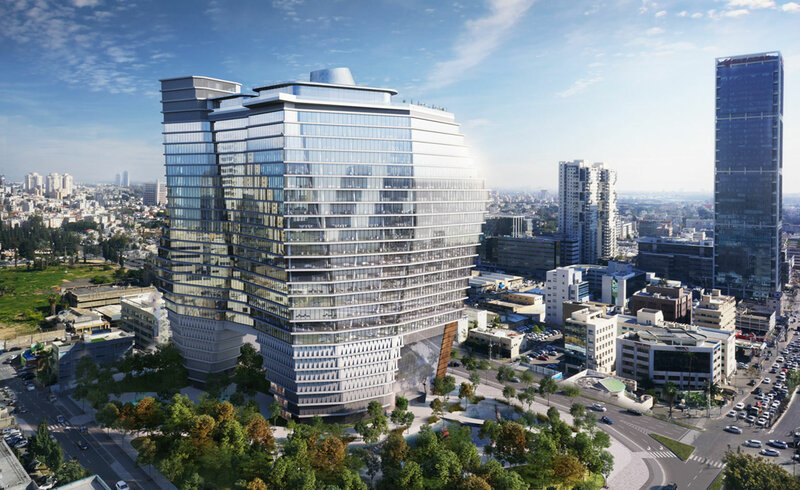 Giants like Facebook, Apple, and Amazon get cosy with specialist groups like WeWork, drone safety startup ParaZero and VR darling Magic Leap, all of which have bought into multiple floors of upcoming tower projects including Ron Arad’s ToHA development, Pitsou Kedem’s C6 Tower and the 72-floor Sarona Tower which nears completion. 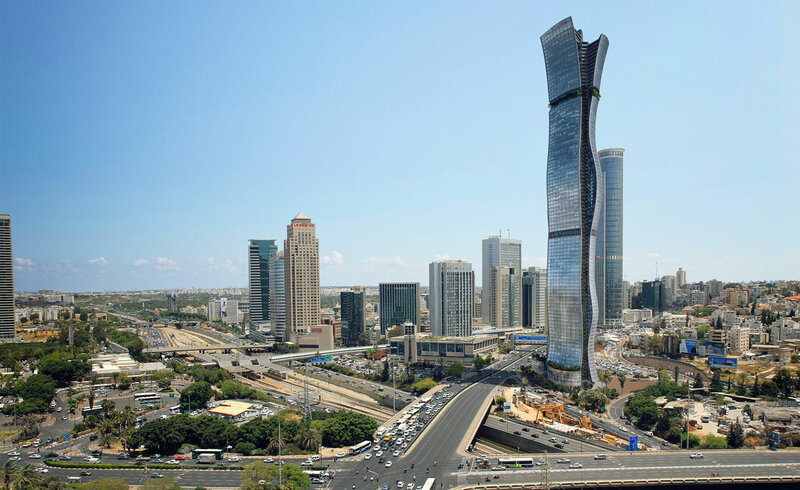 Tel Aviv’s endless blue skies may yet have found their match in the city’s vertical expansion. 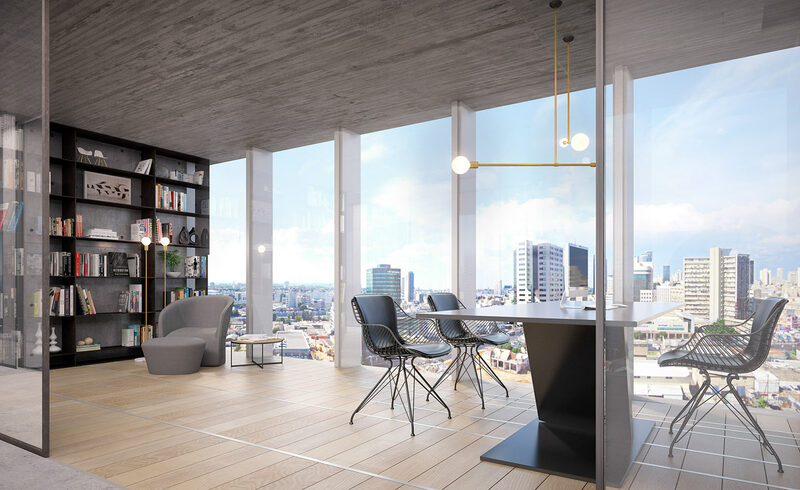 Tel Avivian architectural mainstays MYS Architects join forces with designer-favorite Pitsou Kedem to realize the $50m, 50,000sq m Acro C6 Tower. Climbing to 34 floors, the mixed-use tower will primarily consist of office units anchored by 3 floors of commercial activity. Conceived of as an art-architecture fusion, the Bauhaus-inspired structure will host its own art gallery, conceptual light installations, and bespoke carpeting as part of its interior design by Pitsou Kedem. 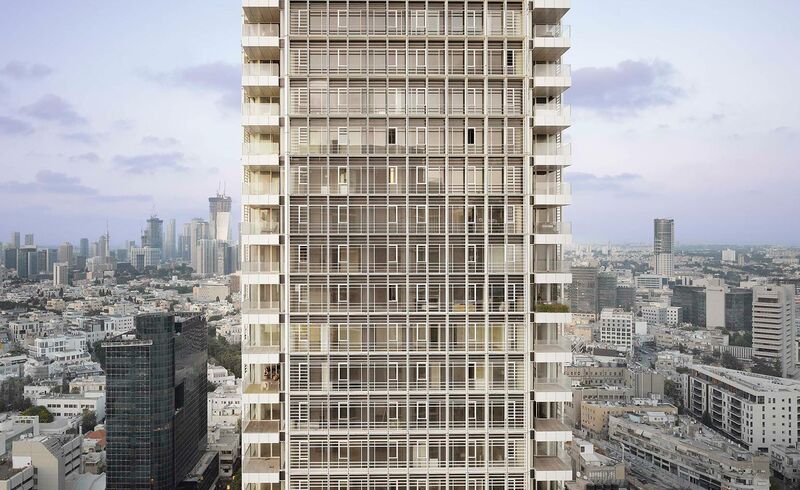 A household name in the West, Richard Meier’s Bauhaus-inspired residential tower straddles the lengths of the famed Rothschild Boulevard, and bumps elbows with concurrent products of Tel Aviv’s current tech tower boom including the Sarona Tower and iconic Azrieli Centre. It’s rare for a 1.8 hectare site to become available in any city centre; British architect Ron Arad’s in-progress ToHA will grace its namesake, Totzeret Haaretz Street, in the heart of Tel Aviv near the bohemian paradise of Carmel Market. Nicknamed the ‘Iceberg’, its two office towers clock in at 28 floors and 63 floors, together offering 160,000 sq m of floor space. Still, the complex will remain light on its feet, supported by slim core ‘legs’ enmeshed within densely planted landscape. Whatever way you cut it – 100 stories, 400 m tall, or 150,000 m² of floor space – Bein Arim tower will be epic. Already building its reputation as Israel’s own Empire State building, the triangular-shaped structure will take root near the Savidor Central Railway Station at the eastern end of Tel Aviv. Its three sides will symbolically and financially link Tel Aviv to neighbouring Ramat Gan and Givatayim, as partnered cities in the project. Stationed like some industrial aquatic creature on the outskirts of Tel Aviv, the Adelson School of Entrepreneurship melds Mediterranean Bauhaus with factory-like exposed functionality. 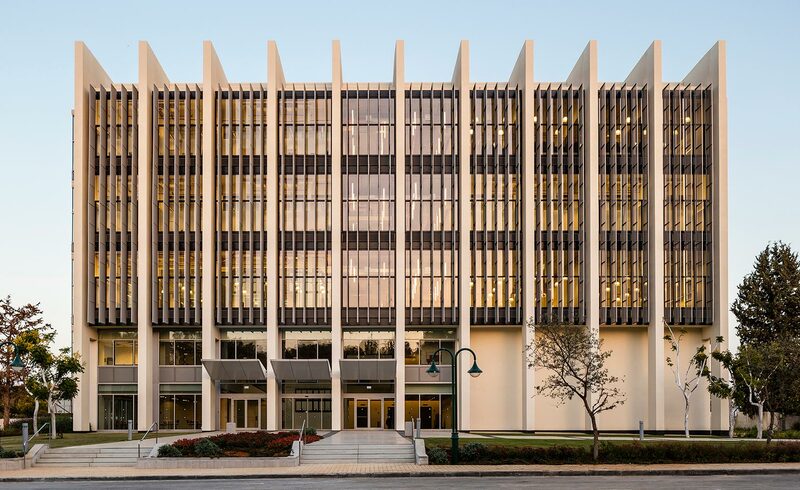 Fins of metal mesh and concrete shield the dark glazed glass façade, which allows a generous glimpse into the building’s inner activity. A suspended steel central staircase anchors the top three floors of classrooms and offices to the open public space and exhibition hall below. 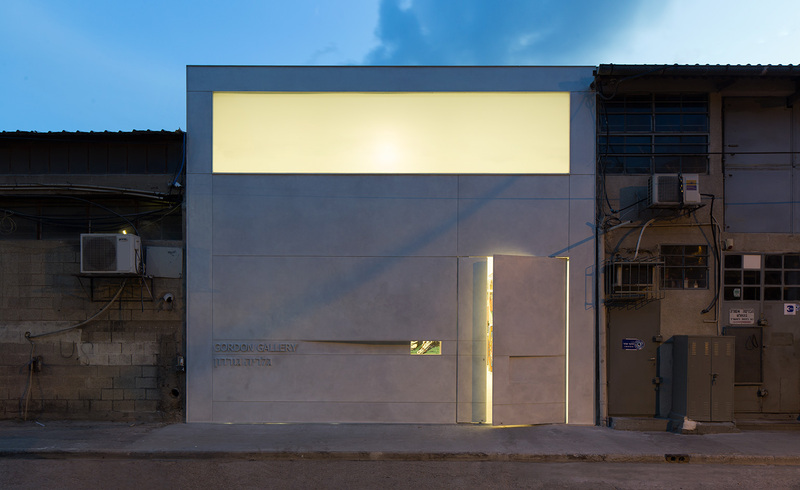 Gordon Gallery’s third outlet in Tel Aviv is nestled on the southern fringe of the city, leaning into the adjacent gallery hotspot of Shapira. A glowing slab of concrete sandwiched between carpentry workshops and a zipper factory, the airy 165 m² space is intended to host a range of contemporary artwork. 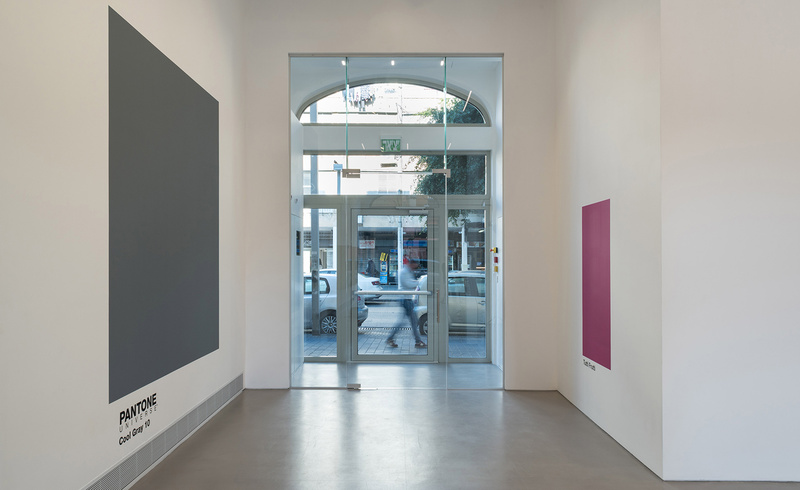 Swedish contemporary art museum and foundation Magasin III opened its Jaffa outpost in early 2018, taking the all-hours lifestyle of the city as its point of inspiration for a 24/7 programme. Tapping Israeli architects Goldschmid Arditi Ben Naim for the sophisticated renovation of the 100-year old building, Magasin III’s light-washed interiors never sleep, but mark a new dawn for Tel Aviv’s art scene. Still, the techies gotta sleep too sometimes, and Western media outlets’ dominant typecast of Tel Aviv’s architecture scene as sleek modernist residential projects isn’t without reason. 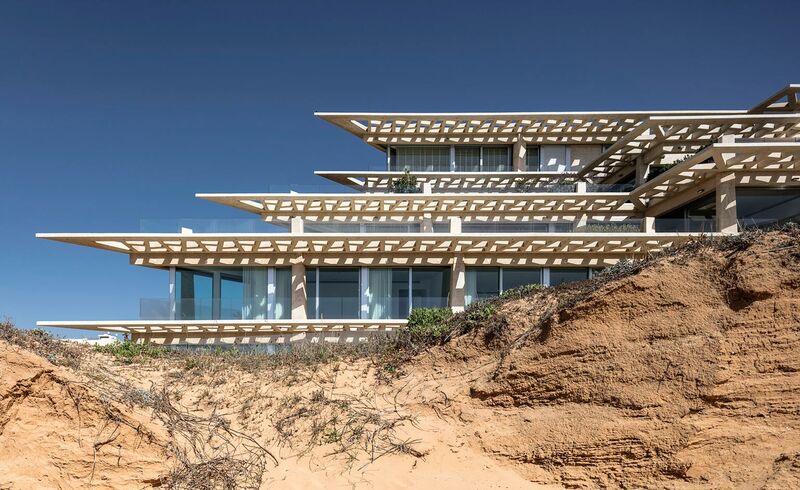 This razor-sharp residential complex by Israeli-Franco Gottesman-Szmelcman Architecture was built for the gated coastal community of Arsuf, Israel, just north of Tel Aviv. It offers stunning sea views and borders the scenic Apollonia National Park. Each of its ten apartments has its own unique layout and size, cultivating the sense of a mini-village.